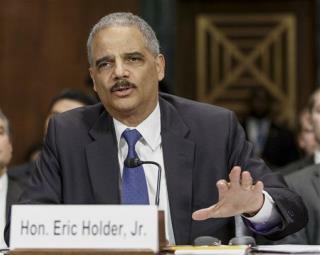 (Newser) – As attorney general Eric Holder pushes for marriage equality, he's taking a controversial stance on the duties of his state counterparts: They don't need to defend laws they believe violate key constitutional values, he tells the New York Times. They shouldn't make their decisions based on politics, he says. But if, after thorough consideration, they see gay marriage bans as a violation of equal protection, they aren't obligated to defend the bans. "Engaging in that process and making that determination is something that’s appropriate for an attorney general to do," Holder says. Are we still going to have to listen to righty whine about this wonderful expansion of rights thirty years from now, like they still whine about racial issues today? tedious. We're all doomed to hell and damnation for our wicked ways and the second coming of Christ will smooth out the rapture for all believers of his words. The non believers will suffer thru the hellfires, pestilence, famine and floods brought forth by the 4 horsemen of the apocolypse until the earth has been swept clear of all sinners. The trees, flowers and fresh plants of many kinds will flourish and the new beginning will take place for those who faithfully follow in the footsteps of Jesus. The oceans will be replenished with fish and the skies will fill with many bird species. So, let the Obama's and Holders and all the others with their desire to reduce our planet to ashes, be aware that many kings and conquerors before them have tried to burn our books and destroy our will but, faith has a very good track record and has survived everyhing the devil has thrown up at us over time and in the final days we shall be the victors and they will rot in hell.